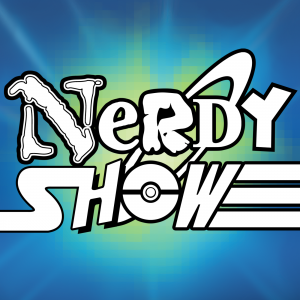 The Nerdy Show Network’s flagship podcast unloads on the latest geek news and happenings! Except when it doesn’t. Sometimes it mutates into something else for a hot minute, and this is one of those times. Presently the production house known as Nerdy Show is in the midst of some massive movements. After the release of The Call of Cthulhu Mystery Program series 2, Cap and Doug dove right into a new major project for Lightning Dogs (still TBA) – so, after a long day of recording stuff they can’t talk about quite yet, and no time to assemble a proper episode of Nerdy Show, they grabbed a friend and piled into the studio for a free-wheeling conversation to catch you up on things and hopefully entertain and delight. Who is this mystery friend? Cap and Doug are joined by Eleanor Edwards, co-host of Consequence Podcast Network‘s The Fifth Dimension: A Twilight Zone Podcast, and Cap’s partner of 16 years who’s been behind-the-scenes this entire time, but hasn’t truly graced us with her presence until now. Crazy! We discuss the new Twilight Zone, RoboCop, JFK erotica, and a host of other strange media and critical diversions into the life and times of the Nerdy Show crew.